Author: Regula Christiansen-Bolli. Series edited by: Harry Stroomer. 16 pp. Roman, 327 pp. The present study provides a detailed description of Tadaksahak, a Northern Songhay branch of the Nilo-Saharan language group. It is spoken by approximately 30,000 people, consisting mostly of the ethnic group of the Idaksahak who are living in the East of Mali as well as in isolated places in western Niger. The book is divided into four chapters giving a complete overview: The first short chapter provides information about the background of the Idaksahak. In the second chapter, the phonological features of the language are described, while the third chapter is dedicated to the description of the morphology of Tadaksahak. It is shown that verbal derivation pulls on unrelated Tamasheq for causative, reciprocal and middle as well as passive. In addition, any verb root that is of Songhay origin is suppleted when derived and a semantic equivalent of Tamasheq origin takes its place. Another non-Songhay feature concerns inflection where the subject pronoun cliticizes to the verb and is always present even when a noun phrase holds the subject slot. The nominalization strategy used depends on the etymology of the term, a feature paralleled in the formation of adjectives. The last chapter is dedicated to the syntax of the language and presents different types of noun phrases. In addition, the different types of simple clauses are treated as well as focalization and topicalization in such clauses. Question words and complement clauses including the two possible relativization strategies are also considered, while the last section about complex sentences presents subordinate clauses. In the appendices two texts with glosses, lists of verb roots with their suppletions when derived, a wordlist Tadaksahak-English containing Songhay cognates and an index English-Tadaksahak are given. 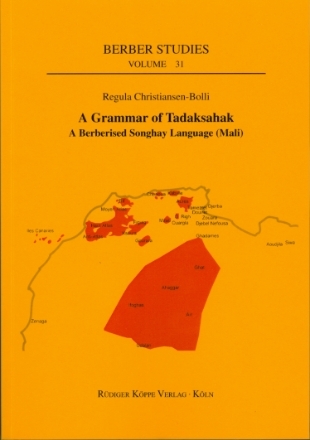 “A Grammar of Tadaksahak” is a methodical, relatively extensive survey of a hitherto practically undocumented language of extreme interest for the study of language contact. It will be equally useful as a reference for typologists and for anthropologists studying northern Mali and Niger. However, while it gives a rather thorough picture of the Tadaksahak language itself, it gives only a partial picture of the effects of contact with Berber on it; with a handful of exceptions, comparisons with Berber are limited to Tuareg, and the presence of apparently Berber forms with no Tuareg equivalents is left unexplained. It is be hoped that future research in Northern Songhay will address this gap. This volume will figure significantly in the emerging comparative linguistics of the Saharan region (Berber, Songhay, and Arabic), in which northern Songhay languages figure prominently. We are fortunate that the author (and Niels Christiansen) were able to spend several years in Menaka until 2002, when the security situation in the area began to deteriorate.